The SR 150 Race gets Aprilia RS-GP inspired styling, featuring the same bright colours as of the MotoGP racing prototype. Meet the new Aprilia SR 150 Race. As the name suggests, it’s essentially a sportier and snazzier variant of the regular SR 150. Updates are mostly cosmetic, meaning this sporty scooter gets a unique paint scheme and racy decals that are in line with Aprilia Racing’s RS-GP MotoGP racing prototype. Price? To get one home, you need to shell out Rs 70,288 (ex-showroom, Mumbai) – roughly two grand more than the regular version. 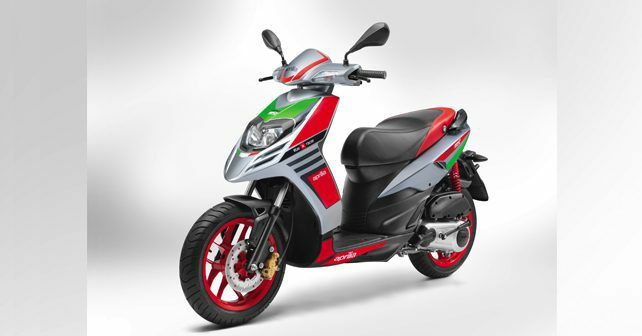 With the Race edition, Aprilia is apparently trying to offer the buyers a scooter that’s inspired by its racing operations. And that’s why the bodywork of the SR 150 Race mimics the racing livery of the MotoGP bike. The scooter, in this guise, flaunts a grey base tone with red and bright green body graphics, while it also gets red alloy wheels and front brake calliper with gold finish. The rear shock spring has also been painted red. Aprilia also points out that the suspension setup has been slightly tweaked so as to make it a wee-bit more engaging. On the mechanical front, there are no changes to speak of. It retains the same 154.8cc single-cylinder air-cooled engine that develops 10.4bhp@6,750rpm and 11.5Nm of torque at 5,000rpm. The engine is mated to a CVT automatic gearbox. Braking force comes courtesy of a 220mm front disc and a 140mm rear drum. The Aprilia SR 150 - or its newly launched Race version, for that matter - does not have a direct rival in the market as of now. Only its sibling, the Vespa 150, comes close to being a real competitor - albeit both the scooters are targeted at entirely different kind of buyers.